The Songhai Empire was the largest and last of the three major pre-colonial empires to emerge in West Africa. From its capital at Gao on the Niger River, Songhai expanded in all directions until it stretched from the Atlantic Ocean (modern Senegal and Gambia) to what is now Northwest Nigeria and central Niger. Gao, Songhai’s capital, which remains to this day a small Niger River trading center, was home to the famous Goa Mosque and the Tomb of Askia, the most important of the Songhai emperors. The cities of Timbuktu and Djenne were the other major cultural and commercial centers of the empire. The Songhai people founded Gao around 800 A.D. and established it as their capital in the 11th century during the reign of Dia Kossoi. 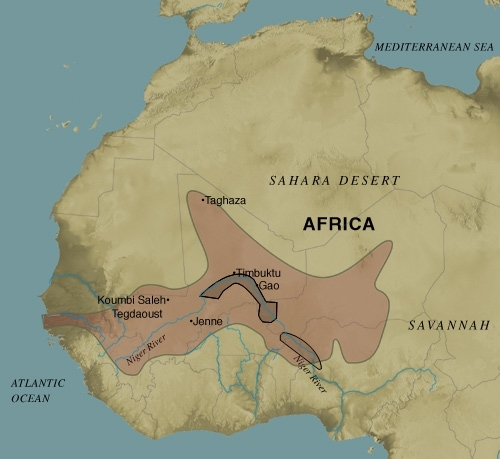 As the city and region grew in importance, the Malian Empire incorporated both as it expanded across the West African savanna. Mali’s power however was eventually weakened by palace intrigue that interrupted the orderly succession of emperors. Recognizing the weakness at the center of Mali, Gao rebelled in 1375. Songhai then began its own imperial expansion at the expense of Mali, conquering Mema in 1465 and three years later siezing Timbuktu, the largest city in the region, from the Taureg who had recently taken it from Mali. Sunni Ali Ber, the military commander responsible for these victories, is widely considered the first great ruler of the Songhai Empire. He continued to enlarge the empire, taking control of important Trans-Saharan trade routes as well as other cities and provinces of Mali. After Sunni Ali Ber’s death in 1492, his son, Sonni Baru, became emperor but soon lost the throne to Askia (Emperor) Muhammad Toure one year later. The new ruler, a devout Muslim, was responsible for few additional conquests. Instead he centalized the bureaucracy, appointing virtually all of the mayors and provincial governors, established Sharia law throughout the empire, expanded Sankore University in Timbuktu and built numerous schools through Songhai. Askia Muhammad Toure also strengthened political and cultural ties with the rest of the Muslim world, encouraging the immigration of scholars and skilled workers from Arabia, Egypt, Morocco and Muslim Spain. He was the first West African ruler to allow the exchange of ambassadors with these and other Muslim states. After Askia Muhammad Toure’s death in 1528, Songhai enjoyed a period of peace and prosperity under a succession of emperors. Urban-centered trade flourished in Gao, Timbuktu and Djenne although the vast majority of Songhai’s inhabitants were small farmers whose fortunes were tied to success in agriculture rather than in commerce. That period of peace and stability ended in 1591 when a civil war created an opportunity for Morocco Sultan Ahmad I al-Mansur Saadi to send an army to conquer Songhai. Al-Mansur hoped to control the West African gold fields and establish himself as the Caliph of Sudan. The invading Moroccans face Askia Ishaq II, the last Songhai Emperor at the Battle of Tondibi. Although they outnumbered the invading army, the Songhai were routed by the Moroccans’s use of primative muskets called arquebus and six cannon, both of which appeared for the first time with this invasion. The Songhai fell back in confusion particulary after Ishaq was killed by the Taureg who were allied with the Moroccans. The Morrocan Army, however, soon realized that conquering Songhai was far easier than governing it. Constant rebellions and resistance and shortages of supplies forced Morocco to send additional resources across the Sahara. Faced with these logistical problems and the near impossibility of controlling the gold mines which prompted the initial invasion, the Moroccans withdrew from the region in 1661. Nonetheless the Songhai Empire could not be reestablished. The surviving elites fled Gao and set up a new capital at Lulami. From 1591 to 1901 various Askias (Emperors) attempted to continue the traditions of the old empire. Finally in 1901 French colonial forces conquered their state, extinguishing the last connection to Songhai’s earlier glory. E. W. Bovill, The Golden Trade of the Moors (New York: Oxford University Press, 1968); Thomas A. Hale and Nouhou Malio, Scribe, Griot and Novelist: Narrative Interpretations of the Songhay Empire (Gainesville: University of Florida Press, 1990); Kevin Shillington, History of Africa (New York: Palgrave, 2005); Ari Nave, “Songhai Empire” in Africana, The Encyclopedia of the African & African American Experience, Kwame Anthony Appiah, and Henry Louis Gates, Jr. eds., (New York: Oxford: University Press, 2005; Timothy Insoll, "Looting the antiquities of Mali: the story continues at Gao." Antiquity 67: 256 (Sept 1993).